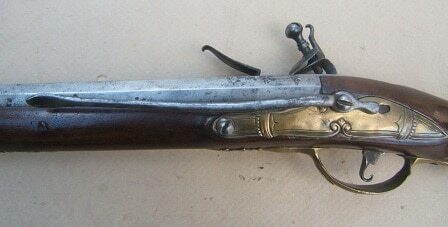 A VERY GOOD+ IRON BARREL BRESCIAN (N. ITALIAN) FLINTLOCK BLUNDERBUSS W/ FOLDING STOCK, ca. 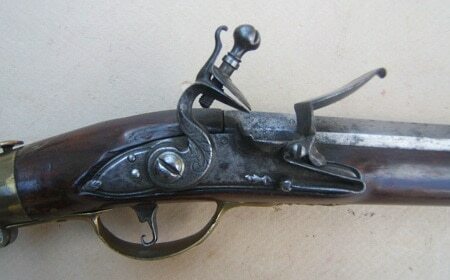 1760: In overall very good+ original flintlock condition. 21 1/2″, pin-fastened, octagonal-to-round, elliptically flared-form muzzle, smoothbore, iron barrel with 1.50+ caliber mouth, a wedding-band transition and its top with several gold inlayed Spanish-type Proof/maker’s marks. The iron breech with a fine touch-hole, light signs of use and some scattered patches of discoloration and expected light scattered wear/pitting. In original flintlock condition with a rounded, lightly engraved lockplate with its original matching scroll-engraved gooseneck hammer, frizzen and original trefoil finial frizzen-spring: in mechanically functional order with fine timing and a strong mainspring. The face of the lock with smooth, steel- gray surfaces with some signs of use and light wear/rust-stains: retains both of its sidebolts. Molded and finely carved, nicely figured, Folding, walnut fullstock with simple raised carvings around the lock and sideplate mortises and a semi-fluted comb. Of rare Hinged/Folding-type buttstock, as made for concealment and/or use within a coach, with its original brass and iron hinge and push-button release. In very good+ condition with scattered handling marks, abrasions, minor old repairs, smooth surfaces and 85% finish. Fully engraved and embossed brass hardware/mounts of classic rococo period form: the trigger-guard with an etched and engraved acanthus leaf forward finial and a line-engraved bow. The buttplate with an scanthus leaf engraved top-finial. Two baluster-type ramrod pipes and a rifle type triangular form sideplate: complete with its sculpted iron belt-hook. Very good+ mounts with untouched smooth surfaces and a dark mustard-toned age patina: some lighter toned highlights. 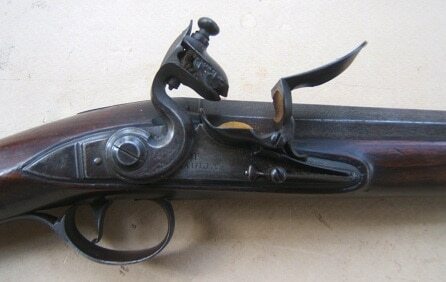 In overall very good+ untouched original flintlock condition. The barrel with sharp contours, a finely toned steel-gray patina and a fine touch-hole. The lock with sharp engraving, its original components and very good+ mechanics. Very good stock with generally sharp contours, 85%+ finish and some scattered handling marks/age-stains, abrasions and signs of use. Complete with its wooden ramrod. 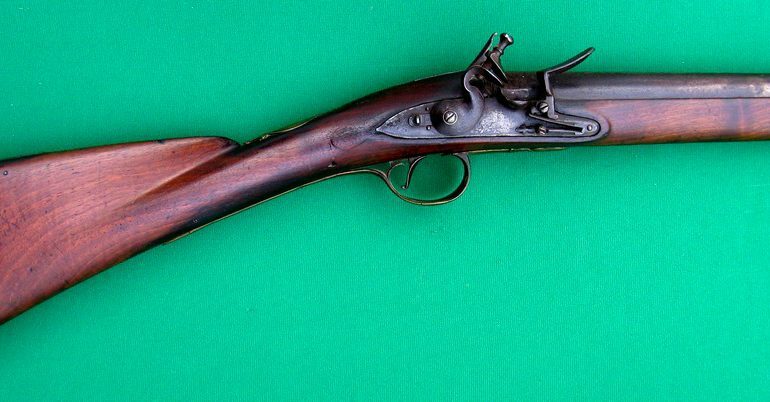 A nice and scarce example of a Folding Stock Blunderbuss, ca. 1760. Overall length, 35″. For similar examples, please see “The Blunderbuss 1500-1900”, by James D. Forman.